MILWAUKEE — The Milwaukee Bucks haven’t played many close games during their 10-3 start to the season but on the few occasions when they had to scramble down the stretch, Eric Bledsoe has come up in a big way. The point guard snapped a two-minute scoring drought late in the fourth quarter Sunday at Denver with a steal and layup, then blocked a Jamal Murray shot that set up a three-point play to put the Bucks in front for good as they wrapped up their four-game road trip with a 121-114 victory. Bledsoe’s defense has improved this season, too. He was matched up against some of the league’s best guards on Milwaukee’s western swing. He held Portland’s Damian Lillard to 13 points and kept Warriors superstar Stephen Curry to 10, marking season-lows for both players. 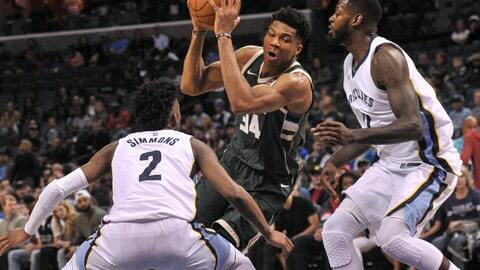 Bledsoe and the Bucks (10-3) will try to protect their perfect 6-0 home record Wednesday night against the Memphis Grizzlies (7-5), who are trying to hold their own despite a rash of early-season injuries. JaMychal Green suffered a broken jaw in Memphis’ second game of the season while Chandler Parsons and Omri Casspi have been limited so far with sore knees. The Grizzlies suffered another hit Monday night when Dillon Brooks suffered a sprained MCL over the weekend. “Honestly, we were talking about that earlier today, that we didn’t realize we have so many guys down,” point guard Mike Conley said. Brooks’ injury left J.B. Bickerstaff with eight available players Monday night in a loss to Utah, but Memphis’ head coach has been pleased with the way his reserves have stepped up. MarShon Brooks played a season-high 22 minutes Monday night, scoring 10 points on 4-of-9 shooting. He’s expected to see a significant increase in action with Dillon Brooks out while Bickerstaff mixes and matches to find the right fit of personnel. More help could be on the way, too. The team issued a statement Monday that said Casspi is “nearing a full recovery from right knee soreness that has sidelined him for the last three games and is expected to return within the next week” while Green is expected within the next two weeks with Parsons, hopefully, not far behind. “We’ve just got to figure out a way to battle through it,” Bickerstaff said. The Bucks swept the season series with Memphis a year ago and have won four of the last five meetings overall, including three in a row.